Your Door Our Glass is Temecula’s source for decorative glass doors and door replacements that can transform the look and feel of your home in an instant. But have you ever wondered how glass door artisans like us make glass doors behind closed doors? In this blog, we’re heading down the YouTube rabbithole to show you few excellent examples of how people make glass doors and modify existing doors to add glass door inserts. This video is a little bit frustrating for us, mainly because it skips over the putting the glass in the door part. But this video is important because it shows the hard work that goes into building a custom door (and setting the stage for glass inserts). Plus, this video proves that not all glass doors have to remind you of church or your grandma’s house! Glass door inserts can take any shape, any size, any color, and any finish—the design opportunities are limitless! The narrative of this video is set very well in the description: the handyman in the video comes home one day, and his wife wants him to put a glass insert into their boring, old door. She doesn’t ask him—after “wanting” the glass door for some time, she just comes home from the hardware store with a glass window insert. This is where the fun begins. He gives his son a video camera, and the handyman goes from #1 Dad to Dan Wheeler, YouTuber and door extraordinaire. This video is as DIY as it gets—but it shows all the dirty work that goes into putting glass in a door, basically in real time. We wouldn’t recommend that you do your own glass insert before you learn a bit more about your door, or develop some Dan Wheeler-level DIY skills, but this video is a nice reminder that every door (your door), no matter how boring, has some potential to be beautiful. All it takes is a little glass (our glass). 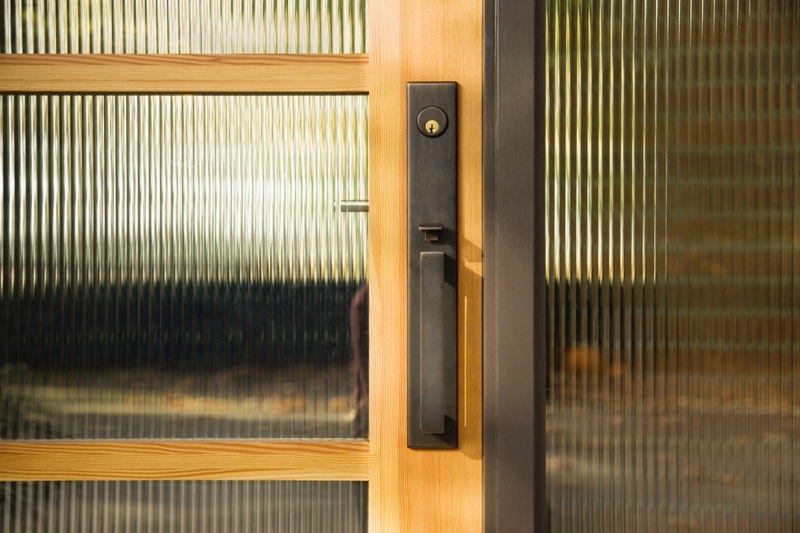 Can I Put Glass In My Fiberglass Entry Doors? Not everyone is blessed enough to have beautiful wooden doors in their home—a lot of us have fiberglass doors. And while some people might think that fiberglass doors can’t have beautiful glass inserts, those people would be very, very wrong. Just ask Gary—the “entry door specialist” in this video—about the design possibilities of putting glass in fiberglass doors. Whether you’re looking to buy a fancy fiberglass door or fix up your old one, all is possible when you leave it to the glass door experts. No matter what kind of door you have, Your Door Our Glass can transform it into a focal point of your curb appeal and your home. Get in touch with us to learn how we can transform your door today!